One business that grabs my attention is Wendy Buyar who runs the Lacombe Community Market. I asked Wendy how she got the idea for the Community Market. Being a vendor herself, she would travel around to small markets to sell the jewelry she makes. The only running market was very limited in space for commercial vendors. She was approached by the City of Lacombe asking if she would be interested in helping with a weekly event in the downtown core. Many of the markets she has had success with include; Canada Day, Harvest Festival, Lacombe Days, The Christmas Faire and more. Wendy came to us looking for a space for housing their A-frames and signs. They come and go weekly during our summer months and less often over winter. The vision in Wendy’s eyes is to see the farmers market join in on the Wednesday evening market. 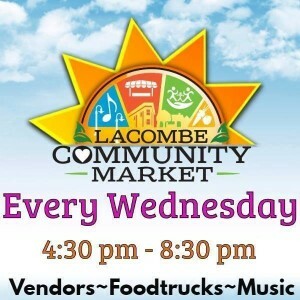 She takes delight in seeing the market continue to grow and become a positive part of Lacombe’s community and tourism.